The emergency alert was sent at 8:07 a.m., and a follow-up alert to state that it was a false alarm wasn't sent until 8:46 a.m.
After an emergency alert of a ballistic missile threat left people "crying and screaming" in Hawaii on Saturday, emergency officials confirmed that the message was sent in error and that no missile was headed for the island state. However, the mistake drew outrage from local leaders and has prompted a federal investigation. The alert, which was sent to people's cell phones at 8:07 a.m., said in all caps, "Ballistic missile threat inbound to Hawaii. Seek immediate shelter. This is not a drill." An alert also appeared on TVs. About 13 minutes after the alert was sent, Hawaii Emergency Management Agency tweeted: "NO missile threat to Hawaii." And Hawaii Rep. Tulsi Gabbard tweeted about the same time a screenshot of the alert on her phone with a clarification that it was a false alarm: "HAWAII - THIS IS A FALSE ALARM. THERE IS NO INCOMING MISSILE TO HAWAII. I HAVE CONFIRMED WITH OFFICIALS THERE IS NO INCOMING MISSILE." After a false missile alert was sent out in Hawaii and sparked widespread panic, Gov. David Ige said the mistake "should not have happened," and Vern Miyagi of Hawaii Emergency Management Agency said the error was "regrettable." 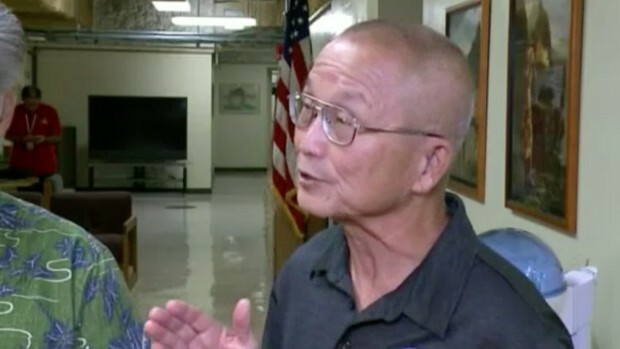 Hawaii Emergency Management Agency Administrator Vern Miyagi confirmed at a news conference Saturday afternoon that the error happened when someone pushed the wrong button. And Gov. David Ige told reporters that the person who pushed the alarm was unaware an error had been made until he received the alert on his mobile device. Miyagi said Ige directed the agency to "hold off" on future tests of the system until the notification protocol is expanded. He said the agency has put a new two-person rule in place during the drill to ensure a false alarm doesn't happen again. Hawaii officials said they are looking into why some of the emergency sirens went off around the island. They are also looking into why some residents didn't receive an emergency alert from their cellphone carrier at all. Miyagi told reporters "This is my team. We made a mistake. We are going to process this and study this to make sure this doesn’t happen again." He declined to comment on the person who made the mistake, but said "you gotta know this guy feels bad right?" Ige apologized for the "pain and confusion" caused by the alert. California resident Elizabeth Fong was in Hawaii looking to buy a house and received the alert. She said she didn't receive a correction alert stating it was a false alarm until 8:46 a.m., nearly 40 minutes after the initial alert. "I prayed to God and asked for forgiveness of my sins and for Him to protect us," she said, adding that people are still shaken up. The aftermath of the false alert was "crazy," she told NBC Bay Area, and prompted people to run around on the streets "crying and screaming," wondering what to do. Andy Thammavongsa, who tweeted a screenshot of his phone that showed the time between each alert, lives in Ewa Beach and told NBC in a Twitter message, "Everyone was panicking, the whole island was awake and alert." He added that "there's nothing really you can do honestly" if the alert were real, saying there's "nowhere to take shelter, the island is only so big." He also said he received a correction alert some 38 minutes later. 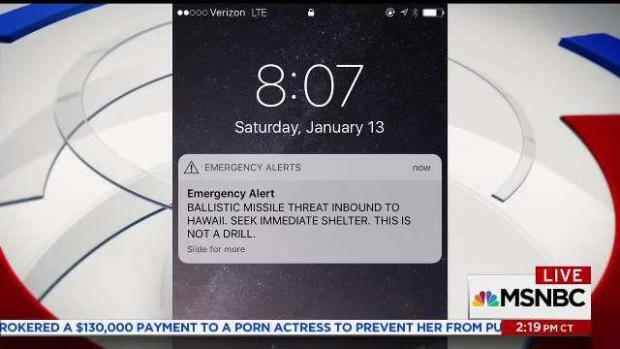 NBC10's Vai Sikahema was in Hawaii when an emergency alert stating a missile was heading toward the island was sent to phones. Vai described how he and his wife reacted to the news during an interview with MSNBC. NBC Philadelphia anchor Vai Sikahema spoke to MSNBC about receiving the alert. Sikahema said he texted his four college-age children, after none picked up the phone, letting them know he and their mom were in Hawaii. He then told them where they could find a will and insurance information. Sikahema said his wife told him: "Hey, if this is it, I guess this is no better place to go then here in Hawaii and the two of us being together." Many people in Hawaii took to social media during and after the alert. At 8:07am everyone in Hawaii got a phone alert: BALLISTIC THREAT INBOUND TO HAWAII. SEEK IMMEDIATE SHELTER. THIS IS NOT A DRILL. The next 10 minutes were the most terrifying of my life, until I finally checked twitter and saw this. Can y’all give some more details on this? Why was this message sent? Was there a missile but it veered in a different direction or something? Transparency please! Saw soccer parents running off the field in fear; my boys & nieces are still very shaken. As parents, we could use some advice from the @HIDOE808 & @HawaiiRedCross as we talk to our children about what happened. Suggestions anyone? Where tf are we supposed to hide ??? Hawaii House Speaker Scott Saiki said the system Hawaii residents have been told to rely on failed miserably. He also took emergency management officials to task for taking 30 minutes to issue a correction, prolonging panic. He said in a statement that the Hawaii House of Representatives will begin an immediate investigation. "Clearly, government agencies are not prepared and lack the capacity to deal with emergency situations," Saiki said. Other local leaders shared similar outrage that such an alert could go out in error. "There is nothing more important to Hawai‘i than professionalizing and fool-proofing this process," Hawaii Sen. Brian Schatz said. "At a time of heightened tensions, we need to make sure all information released to community is accurate. We need to get to the bottom of what happened and make sure it never happens again," said Hawaii Sen. Mazie Hirono. The Federal Communications Commission Chairman Ajit Pai said the agency is launching a full investigation. President Donald Trump, who is spending the weekend in Florida, was briefed on the incident, which prompted defense agencies including the Pentagon and the U.S. Pacific Command to issue the same statement, that they had "detected no ballistic missile threat to Hawaii." Michael Kucharek, spokesman for the North American Aerospace Defense Command in Colorado Springs, Colorado, said NORAD and the U.S. Northern Command are still trying to verify what happened in Hawaii — but that "NORAD did not see anything that indicated any sort of threat to Hawaii." "From a NORAD perspective and that of the U.S. Northern Command, we are still trying to verify what happened," he said of the false alert. NORAD is a U.S.-Canada joint command that conducts aerospace warning, aerospace control and maritime warning to defend North America. The U.S. Northern Command, also based in Colorado Springs, Colorado, is tasked with air, land and sea defense of the continental United States, Alaska, Canada, Mexico and portions of the Caribbean. 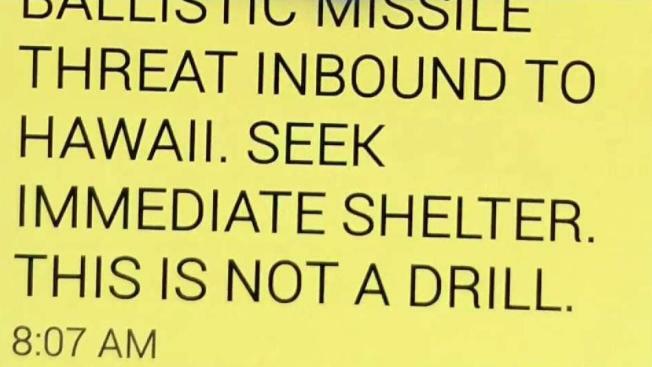 Hawaii tested a warning siren Friday in case of an impending nuclear missile attack. The test comes after North Korea tested a missile that experts believe has the capability to reach the United States mainland. The warning system has not been used since the Cold War. Jaime Malapit, owner of a Honolulu hair salon, texted his clients that he was cancelling their appointments and was closing his shop for the day. He said he was still in bed when the phone started going off "like crazy." He thought it was a tsunami warning at first. "I woke up and saw missile warning and thought no way. I thought 'No, this is not happening today,'" Malapit said. He was still "a little freaked out" and feeling paranoid even after hearing it was a false alarm. Richard Ing, a Honolulu attorney, was doing a construction project at home when his wife told him about the alert. He dug his phone out and had confirmed he had the same alert. Attempts to find further information on the television or radio didn't provide further information, but then he saw on Twitter that it was a false alarm. While he was trying to confirm, his wife and children were preparing to evacuate in case they needed to move to safer ground. After finding out it was a mistake, Ing tried to find some humor in the situation. "I thought to myself, it must be someone's last day at work or someone got extremely upset at a superior and basically did this as a practical joke,' he said. "But I think it's a very serious problem if it wasn't that, or even it was, it shows that we have problems in the system that can cause major disruption and panic and anxiety among people in Hawaii." With the threat of missiles from North Korea in people's minds, the state reintroduced the Cold War-era warning siren tests last month that drew international attention. But there were problems there, too. Even though the state says nearly 93 percent of the state's 386 sirens worked properly, 12 mistakenly played an ambulance siren. At the tourist mecca of Waikiki, the sirens were barely audible, prompting officials to add more sirens there and to reposition ones already in place. NBC Bay Area, NBC Philadelphia and NBC editor Liz Lane contributed to this report.